When done right, a cheese plate is the centerpiece of the hors d’oeuvres table, a captivating conversation piece, and a creative masterpiece. When entertaining, we want to treat our guests to a stunning spread that will really wow them. But the thought of composing a balanced and beautiful cheese plate is daunting. How many cheeses should I choose? What is the difference between all those fancy little knives? What in the world is an accouterment?! Okay, breathe. This is supposed to be fun. At Old Europe Cheese, we’re here to calm your cheese board insecurities. Cheese board curation is far from a rigid art and you don’t have to be a Michelin star chef or an award-winning cheesemonger to put together a gorgeous cheese plate. Focus on variety and unique combinations. Our taste buds get bored quickly and easily, and demand to be entertained. When choosing the cheeses for your Reny Picot cheese plate, consider texture, intensity, and appearance. Choose some cheeses that are soft, some that are hard, some that are mild, and some cheeses that are stronger. And since we eat with our eyes, it’s important to choose cheeses that simply look different from one another. Reny Picot cheeses come in all sorts of shapes and sizes, so just choose your favorites and you’ll have the foundation of a perfect cheese plate. Accompaniments (also called accouterments) fill in the gaps on your cheese plate and add some other flavor profiles while also serving as a sidecar palate cleanser. This is where you get to have fun, add some color to the plate, and clean out whatever is already in your pantry or fridge. Bust out the pickles, fruits, nuts, mustards, olives, and jams to add to the spread. While there are many traditional, more familiar pairings, it doesn’t mean you shouldn’t think outside the box. The options are pretty much limitless and anything goes when picking your pairings. Plus, your guests will appreciate the chance to play around with different flavor and texture combinations. Suggested pairings for each Reny Picot cheese are listed on product pages, but some of our favorite off-the-wall picks include bright cherry tomatoes, pomegranate seeds, and the gooey golden deliciousness of honeycomb. Reny Picot cheeses are certainly tasty enough to stand on their own, but they prefer to be chauffeured around when they show up to a party. The best edible vehicles to have at the ready are the obvious bread and crackers. Arrange crackers near the harder cheeses and slice some bread to place near the soft cheeses. Opt for more neutral selections when it comes to crackers and picking up a crusty baguette from the bakery is ideal. Bonus points if you warm the slices in the oven just before serving. Don’t leave your guests hanging! Make sure each element of your cheese plate has a serving utensil where needed. A set of cheese knives typically includes one with pointy end to break and grab chunks of hard cheese, a sharp one shaped like a mini axe for slicing, and a spreader for, well, spreading. Add small spoons or spreaders to bowls of jam, and place toothpicks out for snatching up fruit and olives. Be sure to serve each cheese with its own knife to keep flavors separate from one another. For a thoughtful finishing touch, use labels to help your guests identify what cheese they’re eating. Of course your guests are going to be so mesmerized that they will delightedly eat any cheese on the plate—labeled or not, but labels are nice for a couple of reasons. First, you won’t need to constantly recite names all evening, and second, if a guest absolutely loves your pick, they’ll know the name for their cheese buying purposes. There you have it! 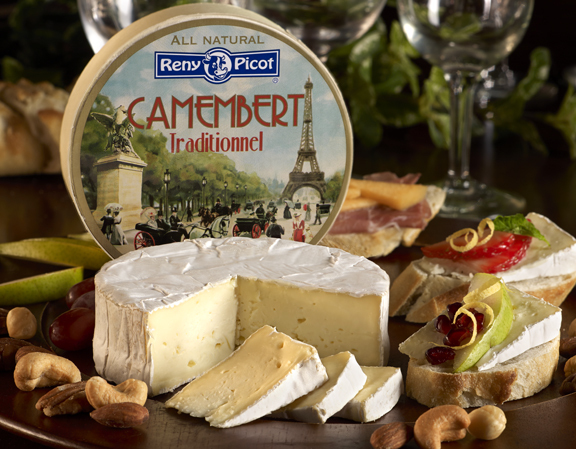 Following these simple steps will get you on your way to cheese plate perfection and have your guests thanking you for opening their eyes to the wonderful world of Reny Picot cheese. If hosting duties are in your future, check out all of the cheeses we offer at Old Europe Cheese to spark inspiration and start brainstorming a blueprint for your perfect Reny Picot cheese plate. If you have any cheese plating tips, recipes, or favorite pairings—let us know! Contact us today to share your thoughts or if you have any questions for us here at Old Europe Cheese. We’d love to hear from you!